Lagrange multipliers are a method for locally minimizing or maximizing a function, subject to one or more constraints. For example, find the values of and that make as small as possible, while satisfying the constraint . What follows is an explanation of how to use Lagrange multipliers and why they work. The explanation (especially of why they work) is much simpler with only one constraint, so we’ll start with an intuitive argument in that case and then move on to a slightly more rigorous argument in the case with multiple constraints. Both cases require some familiarity with partial derivatives and vectors. Why do Lagrange multipliers work? It is tempting to think that we are finding a constrained minimum of by finding an unconstrained minimum of ; after all, we are setting all the partials of equal to zero. But this is wrong. The solution turns out to actually never be a local minimum or maximum for ; it’s always a saddle point for . So why do Lagrange multipliers work? The answer has to do with level curves and gradients. A level curve of a function is the set of points for which the function equals a constant value. (In three dimensions they’re called level surfaces, and more generally, level sets.) 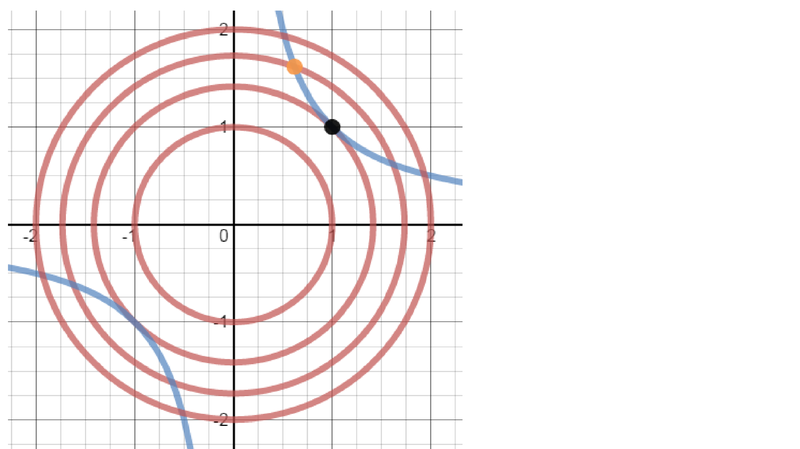 In the picture above, the red circles are some of the level curves of (larger circles correspond to higher values of ). The blue curve is the set of points that satisfy the constraint , making it a level curve of . If is in the direction of the level curve, we will have , which means that . In other words, the dot product of and is zero. Since is in the direction of the level curve, this means that the level curve and the gradient are perpendicular to each other. The method of Lagrange multipliers is to produce these equations and solve them. However, it is usually described in terms of the Lagrangian function . Setting the partial derivatives of the Lagrangian with respect to , , and equal to zero reproduces exactly the boxed equations above. For instance, . Setting this equal to zero gives you the first equation in the box. For the last equation, . If you prefer, you don’t need to worry about the Lagrangian at all; you just need to find a point and a scalar , such that and the constraint is satisfied. Such points will be your candidates for the constrained minimum (or maximum). To summarize, constrained minima and maxima occur at points where the level curve of the constraint function is tangent to the level curve of the objective function . This happens when , giving us the equations in the box above. The Lagrangian function unifies those equations together in terms of the partial derivatives of one function. (We’ll use for an index into the constraints and for an index into the variables .) The constrained minimum occurs at a point where all of the partial derivatives of are zero. Setting them all equal to zero yields the solution: and . This equivalence follows from the fact that component of the above equation says that , while , so setting the partial equal to zero for each from to is equivalent to the vector equation above. Note that setting the partials equal to zero simply enforces the constraints . In the one constraint case, it is useful to find points where because that implies that the level curves of are tangent to the level curves of . In the multiple constraints case, it’s not so simple. The level surfaces of the individual are not necessarily tangent to the level surface of at the constrained minimum. (In the example above, the constraint plane intersects the level surface of , the sphere , at the optimal point, .) Instead, it turns out that the intersection of all the level surfaces of the is tangent to the level surface of . 2. There exist through such that . Happily, it turns out that conditions 1 and 2 are equivalent to each other. Theorem: Conditions 1 and 2 are equivalent to each other. Proof: (Why do a rigorous proof now when we’ve been waving our hands all day? Sometimes the most intuitive argument for something is a proof; perhaps this is such a case.) First we’ll show that 2 implies 1. Assume that , and that for every from to . Since , . Therefore . This implies that . Next we’ll show that 1 implies 2, or equivalently, that not 2 implies not 1. The negation of 2 says that is not in the span of the vectors . Let’s denote by the projection of into the span of the , and set . We will show that is a counterexample establishing the negation of condition 1. We know that , so , and by the definition of projection, for each . Additionally, , Since is in the span of the , all of which are perpendicular to , as well. Adding and , we get . That is, , so is not perpendicular to . Since is perpendicular to all of the , but not to , condition 1 is violated. We assumed the negation of condition 2, so this shows that not 2 implies not 1, or equivalently, that 1 implies 2. Now we’ve seen that Lagrange multipliers work by finding an and a set of such that . This equation implies that there is no local change to that, to first order, preserves all the constraints but changes the objective function . Therefore the values of that satisfy the equation are candidates for a constrained local minimum or maximum. Solving this vector equation is equivalent to setting the partial derivatives of the Lagrangian function to zero. I hope that sheds some light on how and why Lagrange multipliers work, and makes them seem a bit less like a magic trick. Which Has More Volume, a Dodecahedron or Icosahedron? Which has more volume, a dodecahedron or an icosahedron, both having the same edge length? (The same question can be asked of the cube and octahedron, and the following discussion applies just as well to them.) It’s tempting to think that the icosahedron is bigger, because it has more faces (20 to the dodecahedron’s 12). I think it is also natural to think that they are very close in size. In fact, the dodecahedron has about 3.5 times more volume. However, when the two shapes are the same volume, the dodecahedron’s edges are about 34% shorter. If we expand the dodecahedron to make its edges the same length as the icosahedron’s, that increases the volume by a factor of . In fact, this turns out to be a pretty good way to think about volumes of polyhedra in general. Instead of asking what the relative volumes are for the same edge length, ask what the relative edge lengths are for the same volume. Smaller edge length for the same volume means larger volume for the same edge length. So how can we get a handle on relative edge lengths for the same volume? One useful intuition is to picture two polyhedra that are the same volume as same-sized spheres. Which one will have shorter edges? Well, the vertices are pretty evenly spaced over the surface, so perhaps the one with more vertices will have more closely packed vertices, and therefore shorter edges. This suggests that holding the edge length constant, the solids with more vertices will tend to have larger volumes. Looking back to the table above, this appears to be fairly accurate. Holding edge length constant, the number of vertices seems to correspond pretty well with volume, certainly better than the number of faces or edges. Incidentally, why does the number of faces suggest the wrong volume ordering? This is because different faces are different sizes. Sure, the dodecahedron only has 12 faces, but they are pentagons — much bigger than the icosahedron’s 20 triangular faces. A regular pentagon has about four times as much area as an equilateral triangle with the same edge length. So the 12 pentagons are worth about 48 equilateral triangles. Now we also have a strong face-based intuition that points in the right direction: the dodecahedron is significantly larger than the icosahedron. For Platonic solids, the ordering by number of vertices is the same as the volume ordering. Let’s take a look at a more general class of solids. Archimedean solids have faces that are not all the same, but the faces are still regular polygons, and there is the same configuration of faces at each vertex. For example a cuboctahedron has two squares and two triangles meeting at each vertex. 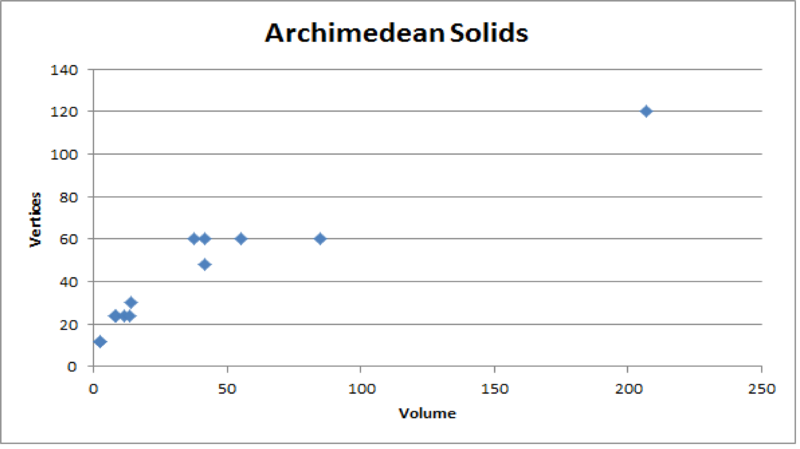 Here are the 13 Archimedean solids in volume order. Well it’s not perfect, but vertices still correspond to volumes far better than faces or edges. Let’s look at the relationship between number of vertices and volume a little more closely. As you can see, the volume does correspond pretty well with the number of vertices, but there are some glaring problems. Most notably, look at the four with 60 vertices; there is over a factor of two between the volumes of the biggest (truncated dodecahedron) and smallest (snub dodecahedron). Above we speculated that for the same volume, more vertices would be more densely packed, leading to shorter edges. Why does the truncated dodecahedron have shorter edges than the snub dodecahedron for the same volume and same number of vertices? Let’s take a look. The snub dodecahedron (left) has 80 triangles and 12 pentagons, and the vertices look pretty well spaced out. The truncated dodecahedron (right) has 20 triangles and 12 decagons. The vertices are not well spaced out at all; they’re basically all lined up to make those big empty decagons. This explains why the truncated dodecahedron has so much volume for a given edge length and number of vertices. For a given volume, the vertices are very unevenly spaced, making the edges short. Finally, do the intuitions we developed above for three-dimensional solids carry over to four-dimensional solids? Absolutely. Six data points isn’t much, but here are the volumes of the four-dimensional Platonic solids (4-d volumes in this case, so multiply by if the side length is ). Looks good to me. The volumes are in the same order as the number of vertices, and the relatively large volume increases correspond to the relatively large increases in the number of vertices.